An award-winning recipe to create an elegant alternative to traditional Italian cannoli--a definite crowd pleaser! Authentic vino cotto (vincotto) is the secret ingredient. Thaw one packet of phyllo dough following the manufacturerâs directions. Preheat oven to 375 degrees Fahrenheit. Using PAM No-Stick Cooking Spray, lightly coat a cookie sheet. Wipe a napkin over the surface of the cookie sheet to evenly spread the no-stick spray. Finely grate 4 to 5 chocolate squares and place into a small bowl. In a small sauce pan, melt the margarine over low heat. While the margarine is slowly melting, carefully unroll one thawed packet of phyllo dough. Remove approx. 20 phyllo sheets (one half packet) and place them onto a flat, dry surface. The remaining 20 phyllo sheets should immediately be rewrapped tightly with plastic wrap and refrigerated. Remove the melted margarine from the heat. Place the first phyllo sheet onto the greased cookie sheet. Dip a pastry brush (soft bristled brush) into the melted butter and spread butter evenly over the entire surface of the first sheet of phyllo dough. Place the second phyllo sheet on top of the first and generously apply butter with the pastry brush until this layer is evenly coated. Repeat these steps until all the phyllo sheets are layered, buttered (including the top sheet) and stacked on the cookie sheet. Press a sharp knife into the buttered phyllo dough stack down the center and horizontally to create four sections. Place the cookie sheet into the preheated oven to bake. Every 10-15 minutes remove the cookie sheet from the oven. Using a spatula, flip each stack of phyllo to evenly cook the dough. It's alright if pieces crumble during this step. Repeat this step until the phyllo dough becomes deep, golden brown and crispy. Some phyllo pieces will become crispier sooner than others. Remove these so they wonât burn, place them into a bowl and set aside. If the center of each stack of phyllo isnât browning up, split each stack in half using a fork or butter knife. Lay the uncooked side facing upward on top of the other sections and repeat Step #10. Keeping each stack of phyllo intact is not necessary. The goal is to brown it up. When the phyllo dough appears light, crispy and dark golden brown all over, remove the cookie sheet from the oven and allow the phyllo to completely cool at room temperature. Important: Do not refrigerate baked phyllo as it will soften. Place all cooled phyllo into a large freezer bag. Using a rolling pin, crumble the phyllo into small pieces. If there are any pieces of phyllo that aren't brittle enough to crumble, remove them. When ready to serve, use 6-ounce martini glasses. Fill the bottom half of the glasses with crumbled phyllo pieces. Drizzle about 1 teaspoon of Vino Cotto over the phyllo pieces. Next, sprinkle a thin layer of grated chocolate over the phyllo pieces. Spoon the chilled ricotta mixture over the grated chocolate leaving about a 1/2" space from the top of each martini glass. Sprinkle another thin layer of grated chocolate over the ricotta surface. To garnish insert one chocolate bar square at an angle into the ricotta. Serve. Yields up to 8 martini glasses. Wow! This is beautifully presented and sounds delicious! Thank you, Cristina! The nice thing about it is that it's easy to make. what a fabulous holiday dessert! Thank you very much, Judee! I have added your web site to my post A Grape Surprise. Hope you get some business from it. Deena, I have added your web site to my post A Grape Surprise. Hope you get some business from it. I posted your article in our Facebook Page. New members are always welcome to join. A Grape Surprise: Mosto Cotto & Raisinée au Vincuit http://turosdolci.wordpress.com/2009/08/24/a-grape-surprise-that-give-tarts-a-new-twist/ I posted your article in our Facebook Page. New members are always welcome to join. Thank you for sharing your two posts on vino cotto (raisinée au vincuit). I enjoyed reading them, and both recipes you included sound delicious! I'm also happy to have learned the French term for this versatile ingredient and condiment. Again, thank you and buon appetito! I'm really happy to find someone who actually sells Vino Cotto. I live in Switzerland and I buy this at the open markets and use it all the time in biscotti and tarts. I've written about it in two blog posts I've listed as follows but I wish people would discorver this because it really adds a different element in tarts, poured over cheese, glazes etc. But I have never found it in the US. Thanks for letting me know about your business. It is called Raisinée au Vincuit here in the French part of Switzerland. I will bookmark your web site. Two posts I have written about this are below. Also, anyone who follows us on Facebook (see link above) can receive a one-time 15% discount on our products (excludes shipping costs). Simply let us know when you place your order. Thank you, Patricia! Actually, our company, Montillo Italian Foods, produces authentic Vino Cotto (sweet "cooked wine" syrup). We follow my husband's 4th generation family recipe from Calabria, Italy. To learn more about Vino Cotto's ancient history, its health benefits and versatility as both an ingredient and condiment, please visit http://www.montilloitalianfoods.com Also, anyone who follows us on Facebook (see link above) can receive a one-time 15% discount on our products (excludes shipping costs). Simply let us know when you place your order. Thanks again! This sounds very creative. I use to work at Lindt and love their chocolate and also love Vino Cotto. However finding Vino Cotto outisde of a wine region I find is a problem. I will have to give this a try. Thanks for the recipe. I'm very excited! 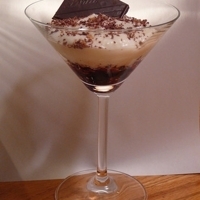 My "Cannoli Martini" Dessert is a finalist in the Athens Foods contest which ends on March 1st. Athens Foods is the largest producer of phyllo dough in the world. As a finalist, this part of the competition is to determine the new FAN FAVORITE recipe.